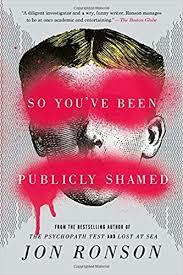 I’ve recently read So You’ve Been Publicly Shamed by British journalist Jon Ronson which looks at a reemergence of public shaming, one where it is the Internet serves as the judge sentencing others to the stocks, the stocks themselves, and the mob throwing rotten fruit at the stocked defendant. One of the reasons such shaming has snuck up on us in today’s culture is that we’ve relegated shame to a collection of second-tier emotions whose burdens modernity is supposed to be freeing us from. But, far from being trivial, shame is the mechanism by which cultures are formed and perpetuated. Philosopher Lee Harris, in his 2007 book The Suicide of Reason, points that that shame is the tool one generation uses to acculturate the next into a society by training children from a young age to feel shameful for believing certain things and acting in certain ways. Religious communities that raise their kids to feel the hot rush of sweat and queasiness (both shaming symptoms) at sin or disbelief is an example of this phenomenon. But, as Harris points out, even moderns raising our kids in a culture of reason do not use reason to get them accept cultural norms such as tolerance of minorities. Rather, we work hard to ensure that our children will feel shame at the gut level for engaging in bigoted behavior, or even having intolerant thoughts. Given the number of people recommending “naming and shaming” as a strategy within our own community of activists, it’s worth looking at the shame phenomenon and when it has proven effective (or not) a bit more closely. One pro-Israel organization that has utilizing shaming tactics with some success is NGO Monitor which has managed to get a number of European governments and organizations to stop funding Palestinian “human rights” NGOs that are actually involved with glorifying terror or spreading propaganda (often as part of BDS campaigns). While exposure of those organizations spending cash to celebrate violence is the tool NGO Monitor uses in its shaming strategy, their success derives from the fact that the entity being shamed (such as European governments) are provided the opportunity to claim that they have not misbehaved themselves but have instead been duped by the Palestinian groups they have funded. This provides them the opening to take the right action (cut off funding) in order to preserve their self-image as tolerant and supportive of human rights, which helps them avoid the shame of knowing (and being seen) to have abandoned those principles. In contrast, campaigns designed to directly shame individuals for their political activity (such as the profiles created by Canary Mission, or postering campaigns on campuses that expose Israel haters by name) are not designed to elicit self-reflection. Rather, they are supposed to create a “price tag” for misbehavior, creating a mechanism whereby future employers, graduate school admissions officers or family members will have full access to an individual’s sordid behavior (often created from background material created by the shamed activist him or herself). The nature of this form of “naming and shaming” explains the mixed response to and level of effectiveness of such campaigns. True believers, for example (those who refuse to accept any self-characterization save unvarnished virtue) see inclusion in Canary Mission as a badge of honor. And those whose inclusion might make them think twice about continuing their activity are making a practical choice based on their own self-interest, rather than engaging in moral reflection. (As an aside, this helps explain why those aforementioned postering campaigns have proven so ineffective, since their narrow audience means they do not create a price tag high enough to trigger a change in behavior). So that’s shaming our enemies. But what about shaming our allies? Such a tactic is not as strange or unusual as you might think. 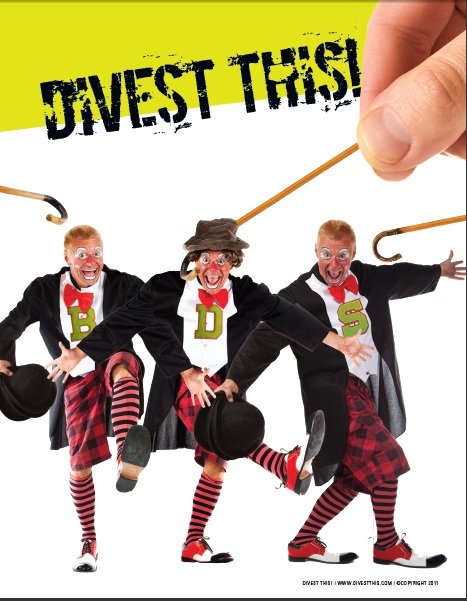 For, within the divided Jewish community, there are many times one group of activists might think another is not doing enough to deal with a particular outbreak of anti-Israel activity. And one way to get others to do what you think they should is to try to shame them into doing so by alerting the world that supposed friends of Israel are either not living by their stated principles or – in some cases – actually doing wrong. In some cases, the shamer can get what they want from the shamee using such tactics. But while the personal shame we feel when we stray from our principles or self-image is made up of emotions like regret and a desire to do better, public shaming usually drives those constructive feelings out in favor of the resentment we all feel at being humiliated. Like shame itself, humiliation (or, more particularly, the need to avoid it) is a major driver of human activity since we will all go to great lengths to make it stop. This can include doing what we’re told will make such humiliation go away. But, more often than not, we respond to shaming with resentment which can lead to anything from passive aggressive “acceptance” to do the right thing once (but never again) to lashing out at those who have chosen to humiliate us (drowning out discussion of whatever issue triggered the original bout of shaming). When supposed allies don’t step up (or worse, do the wrong thing) about an issue we feel passionately about, it’s easy to believe that shaming them serves a strategy purpose (or at least avoid considering the negative impact of a tactic that tends to breed more resentment than repentance). But if we want to utilize powerful but potentially destructive human emotions as political weapons, it might be worth considering what options we have for making friends, neutrals or even wavering enemies feel good about themselves for supporting our cause, rather than hoping self-disgust will motivate others to do the right thing. While I totally agree on the issue of shaming our allies (you were kind enough not to point fingers and shame the one specific organization that has engaged in this particular practice far too often), I’d like to start a conversation about Canary Mission. There are two aspects to this– one is the morality of this effort, the other is the effectiveness. I find it hard to classify as immoral the practice using a person’s own anti-Semitic comments to publicly shame them. While context can be an issue, the comments usually highlighted by Canary Mission don’t have *any* context that can be considered appropriate. I have seen where some students have complained that CM’s activism creates problems for them. But the only concrete example I have seen of this issue is anti-Israel student government representatives decide to vote in secret on BDS measures. (However, note that CM doesn’t publicize voting records, rather it uses social media posts by the individuals themselves). But the (unfortunately, unmeasurable) benefit from this exposure is that it pulls back the veneer of “human rights activism” from BDS to expose the ugly anti-Semitism at its heart. And that’s something that might help in motivating neutrals to support our cause. Happy to engage constructively with anyone who has a different view.